Now you tell me! You want oars as well? Small prize for better caption. 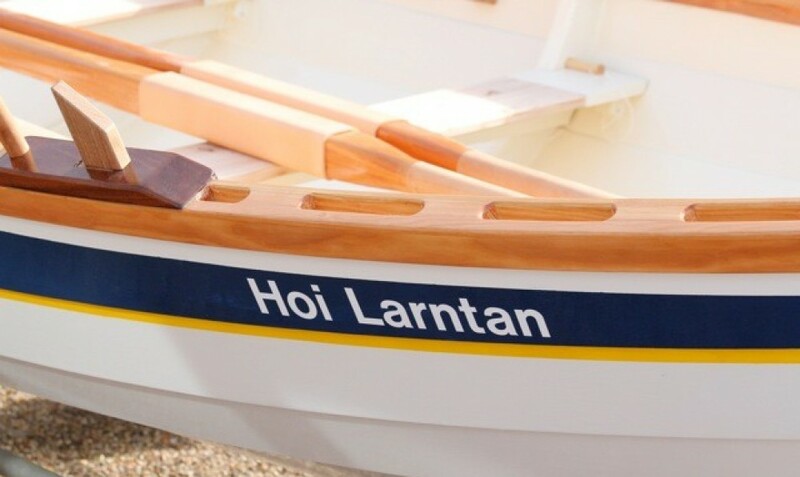 Adrian, our membership guru, has been keeping an eye on Hoi Larntan’s activities to date. With Bluejacket in the water too now, the summer promises to be busy. 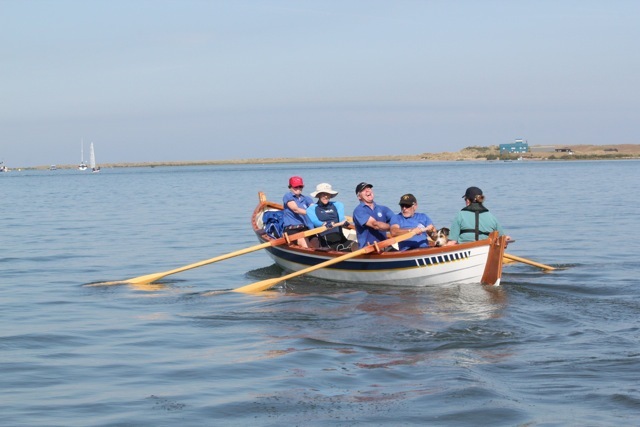 Major highlight after the Bank Holiday weekend will be taking her (HL) to Cork in the South of Ireland for the Ocean to City long distance row – quite a spectacle with masses of different boats from all over the world. 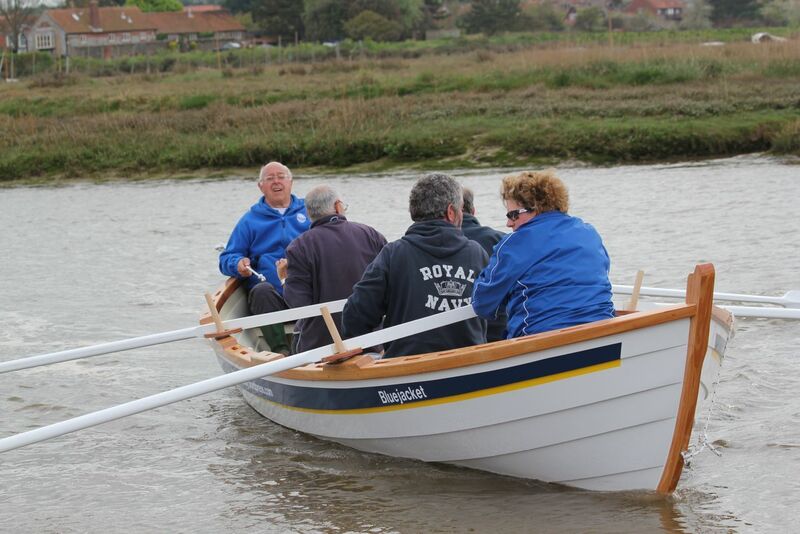 That leaves the rest of us at home to get used to Bluejacket’s amazing new oars here in the Pit at Blakeney! 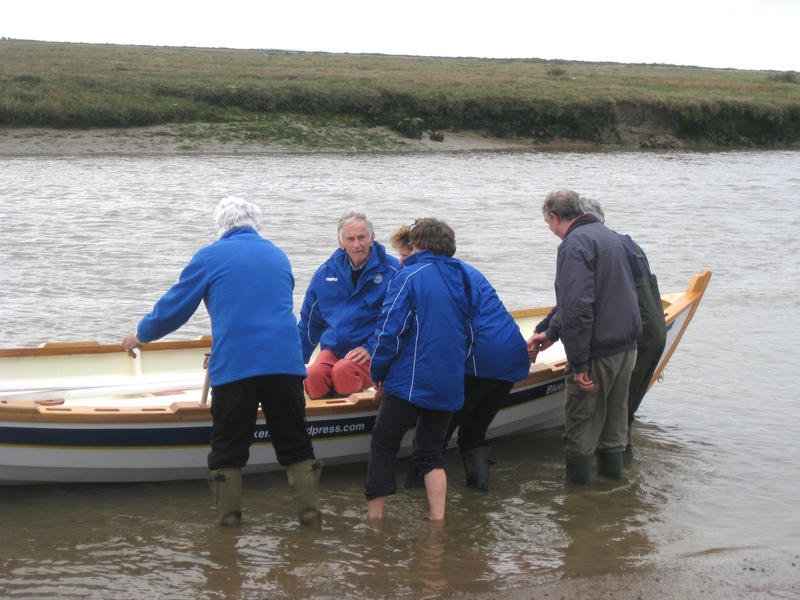 “You may be interested to know who has been using the boats. Top Gun is Victoria with 34 recorded outings, closely followed by Antonia with 31. Then Barry 24, Ian, Alan and Roland on 21. Not bad for a little boat. P.S. the new trailer/trolley combi for Bluejacket is in Peterborough being galvanised as we speak (write?). 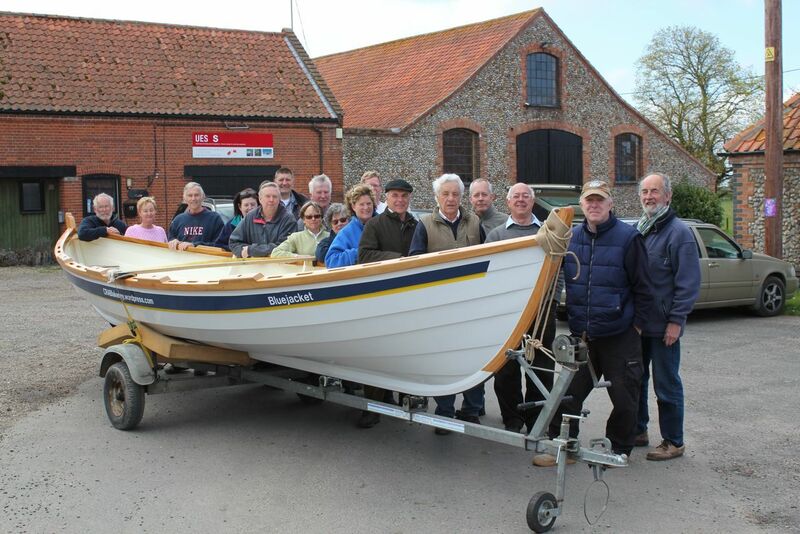 70 or so friends, rowers and well-wishers joined in to launch our second skiff – Bluejacket, built at Barrie Borwell’s yard. 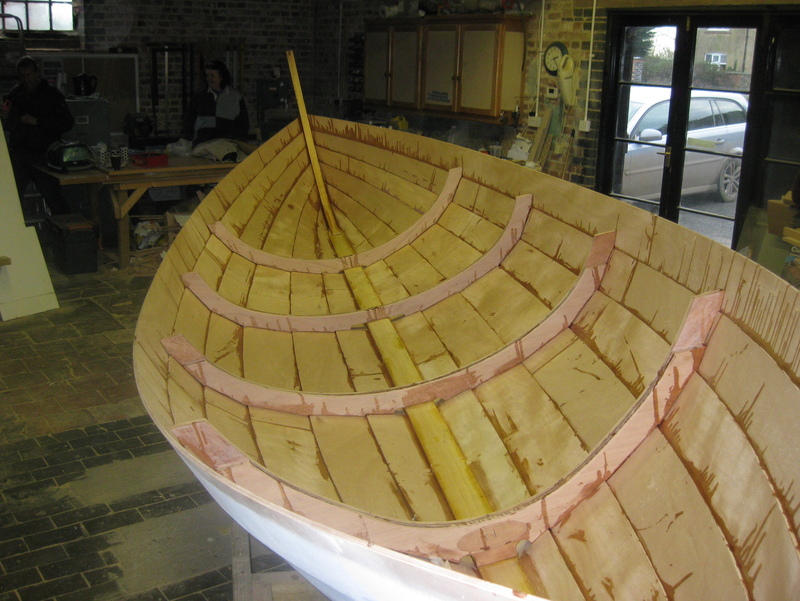 Barrie can be well proud of the fine boat he has produced. 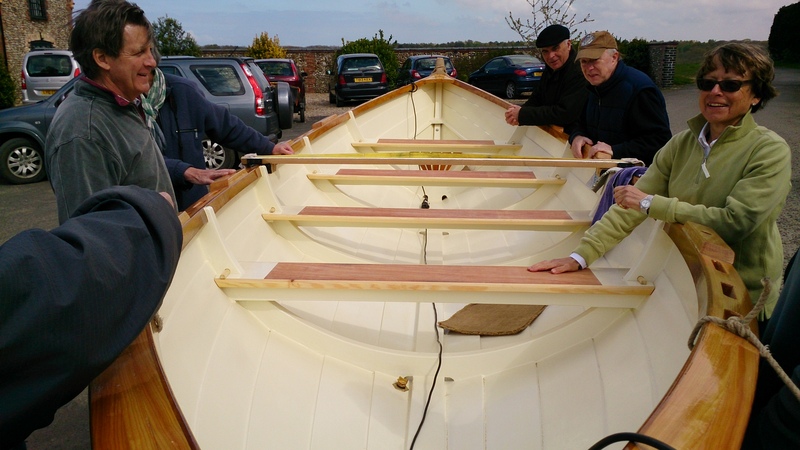 As usual with St Ayles skiffs, many hands came and offered help cutting, sanding, scarfing, glueing, more sanding, turning over, more sanding and then painting. A huge thank you to all who have been involved. 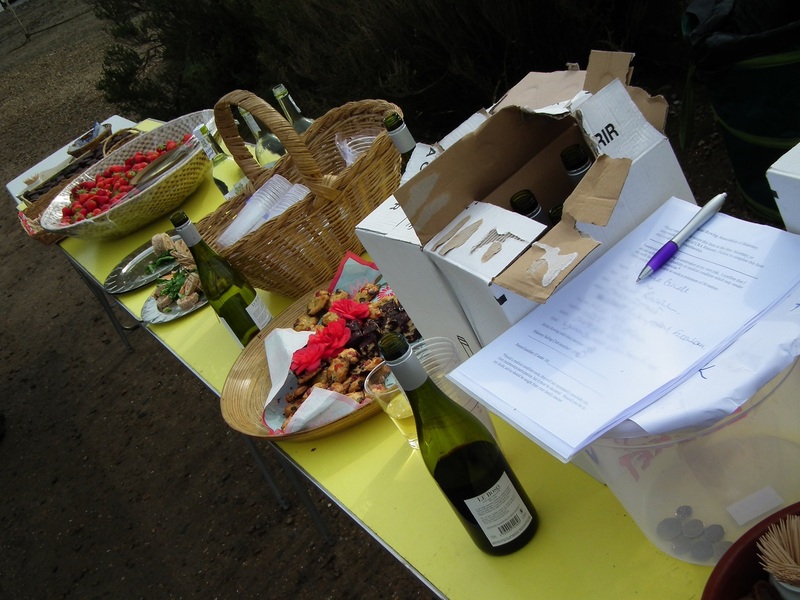 Some have responded at the drop of a hat to lift and turn, some have supported with biscuits and cake. Everyone has contributed. On a damp, grey, windy Saturday afternoon, with more mud than water to begin with, Hoi Larntan was put in the water to await her sibling. Adrian arrived with Bluejacket and the experimental oars on top. Antonia and Juliet loaded the tables to groaning with delicious eats and the odd bottle or two was there to keep our glasses charged and ward off the unhelpful weather. 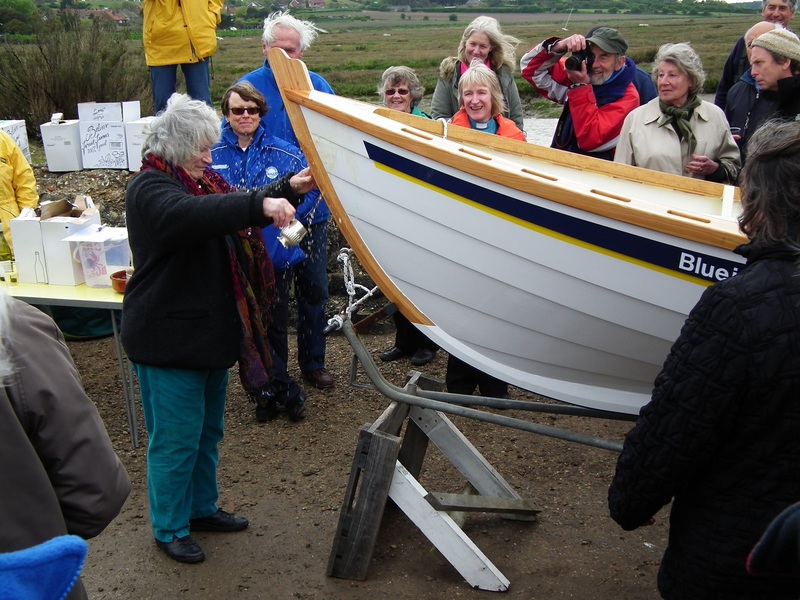 None of this would have been possible without the generous grant from North Norfolk District Council’s Big Society Fund. We were delighted that the Leader of the Council, Tom Fitzpatrick had come to join us and speed us on our way. 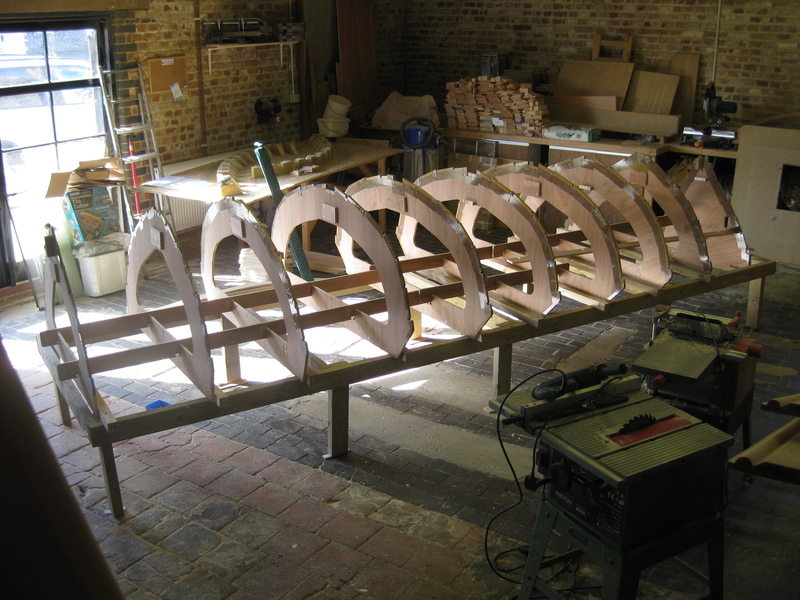 Tom is an experienced sliding seat rower but we soon converted him to fixed seat Coastal style. (see below). 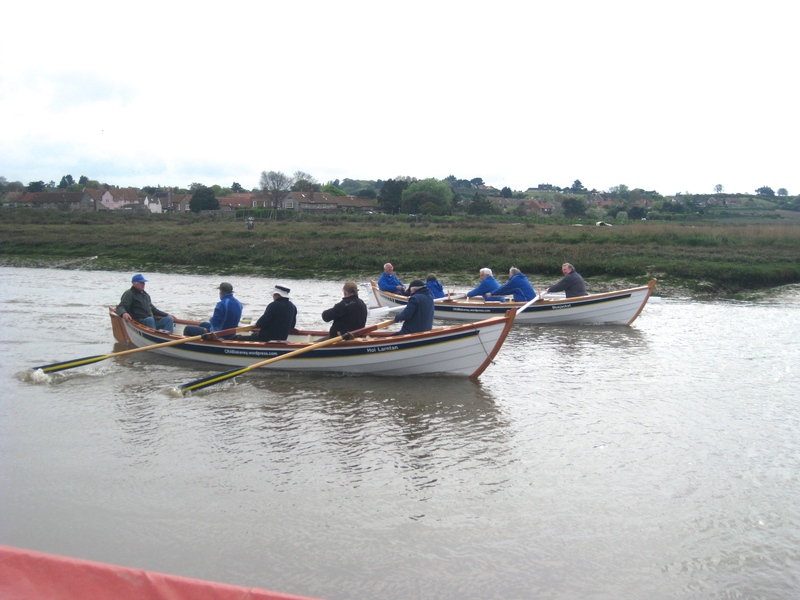 Time to take to the water – Oh the mud! Thank you to everyone involved and all those who took photos for us. 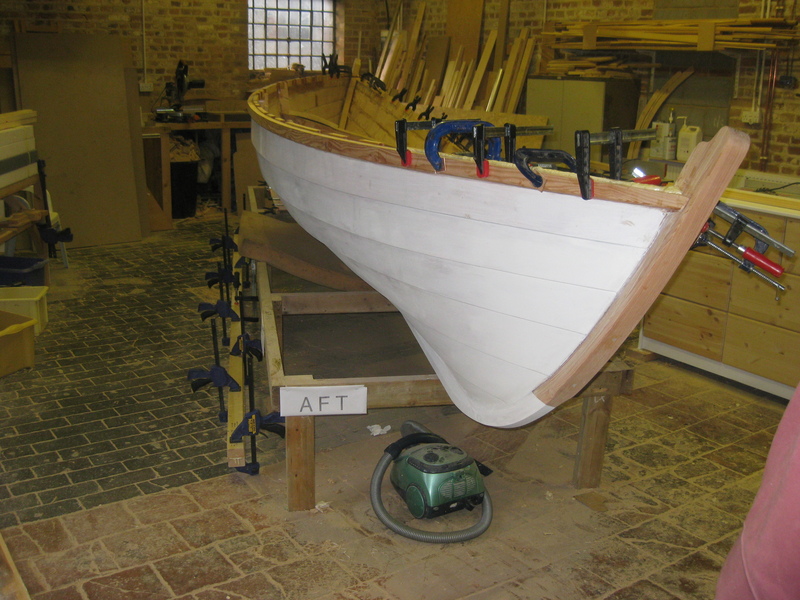 We were especially pleased to see our friends from both Wells and Kings Lynn who are starting to build a pair of skiffs each. 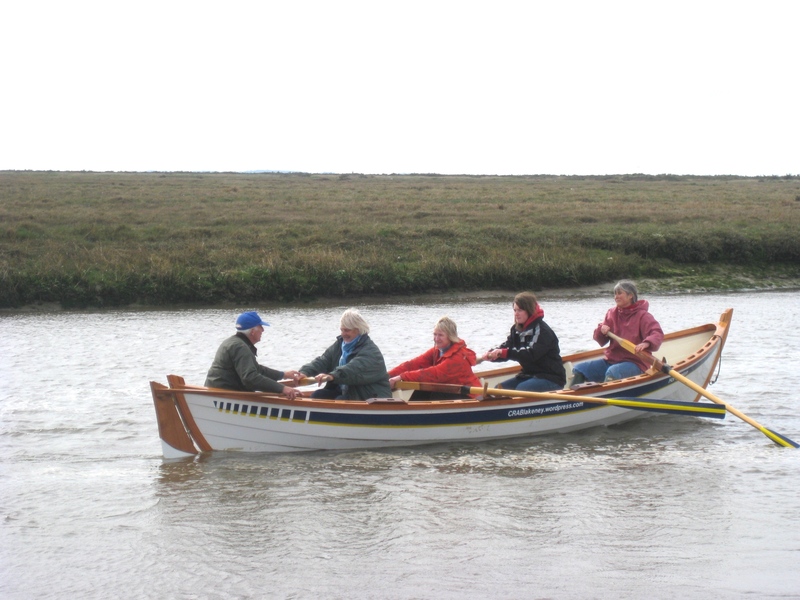 We’ll soon have some fine competition on the North Norfolk coast. Needless to say, the sun made a wan appearance just as we packed up! Our President is chuffed. Dark glasses are so cool! 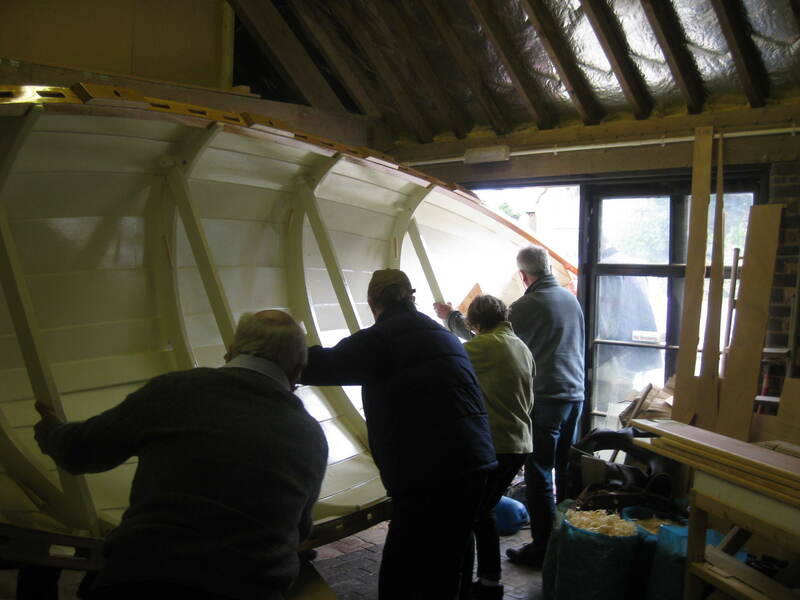 Just how many skiffers does it take to…? Well done Barrie – proper job. You are allowed to smile. 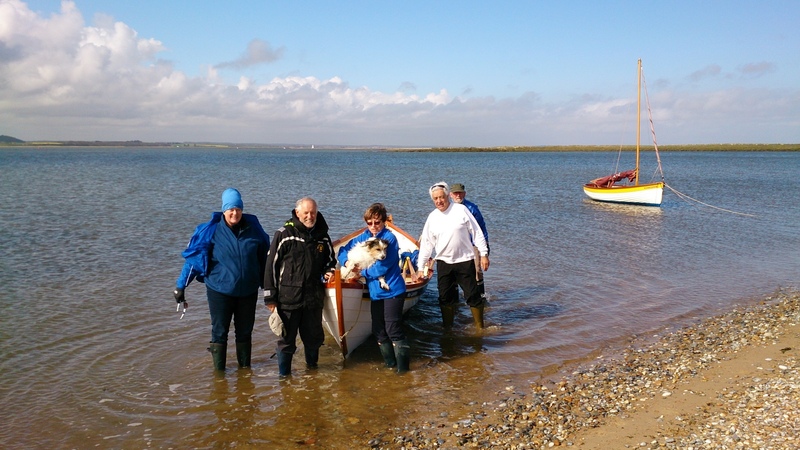 Hoi Larntan – not wishing to be left out; earlier this morning near Blakeney Point. Five men and a dog. Oops, could be in trouble there? Sorry Antonia and Victoria. Many thanks to all who turned out (again) today to help lift and turn. Also further thanks to all who have contributed in whatever way to the emergence of Bluejacket. Next event is her launching party – Saturday 26 April at 15:30 Blakeney Carnser. 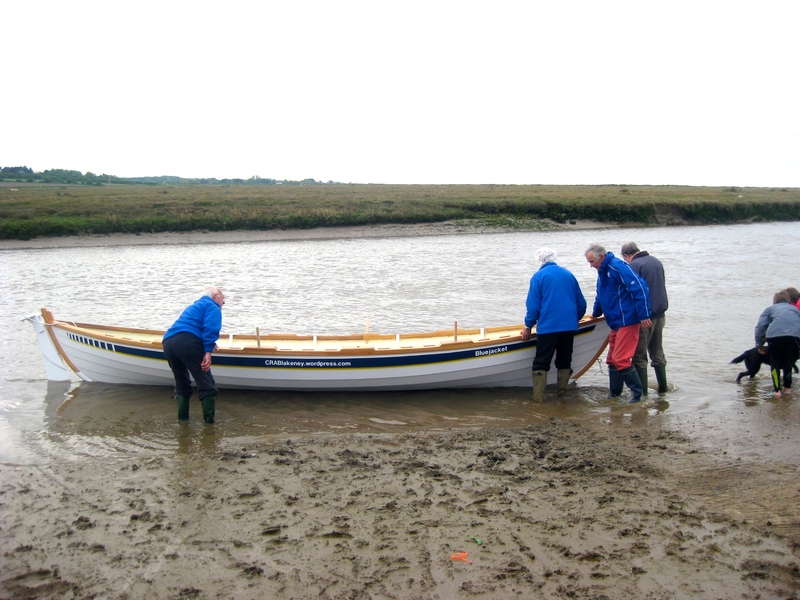 We hope to have friends from far and wide (Wells and KIngs Lynn skiffers too?) 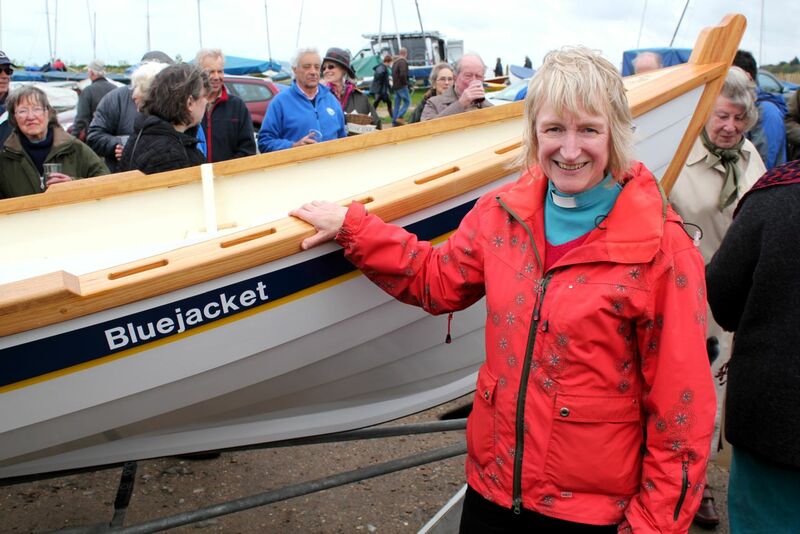 plus a senior representative of North Norfolk District Council’s Big Society Fund without whose valuable community sponsorship Bluejacket would still be a dream. 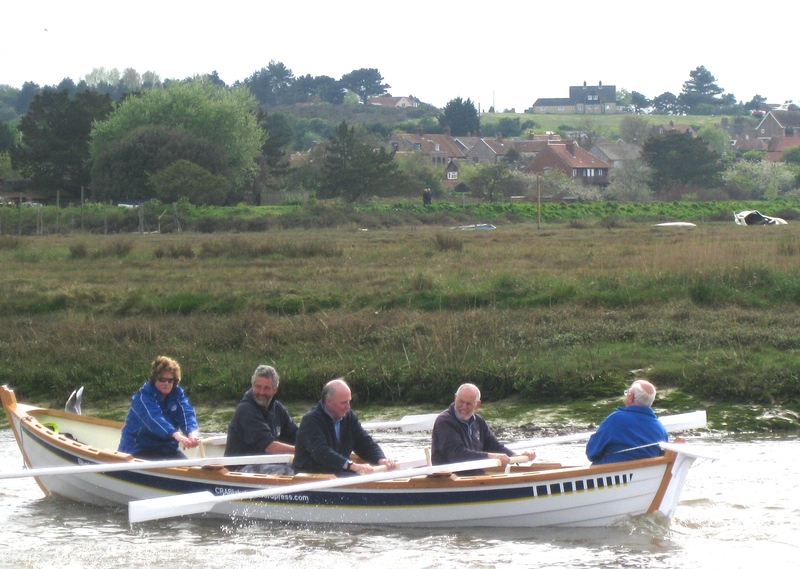 It is with great pleasure that we announce the very generous offer of support to Coastal Rowing Association Blakeney (and in particular our second skiff Bluejacket) from the North Norfolk District Council’s Big Society Fund. 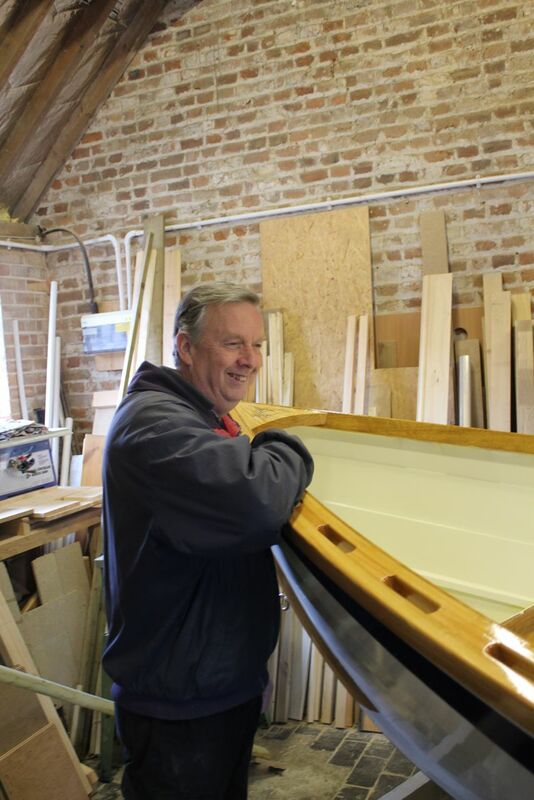 Be there at the launching of Bluejacket Saturday 26 April 15:30 – Blakeney Carnser. Deep in the heart of rural North Norfolk a dedicated band of enthusiasts has been hard at work. 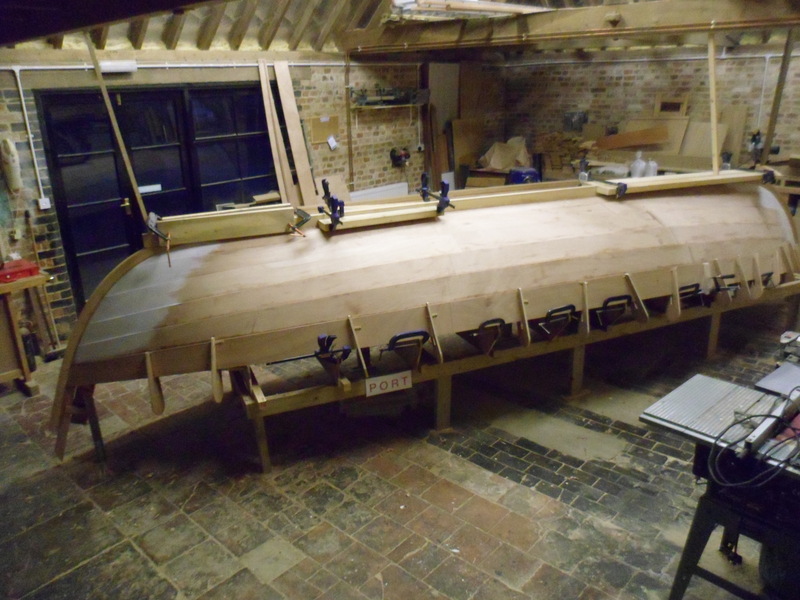 Led by Barrie, misguided by Ian, supported by Barry, Tom, Roland, Victoria, Antonia, Steve and Erica plus regulars Robin and David, Gwen and not forgetting Andrea, Bluejacket has taken shape. Latest addition has been the painting of our familiar colour scheme in the safe hands of Adrian. 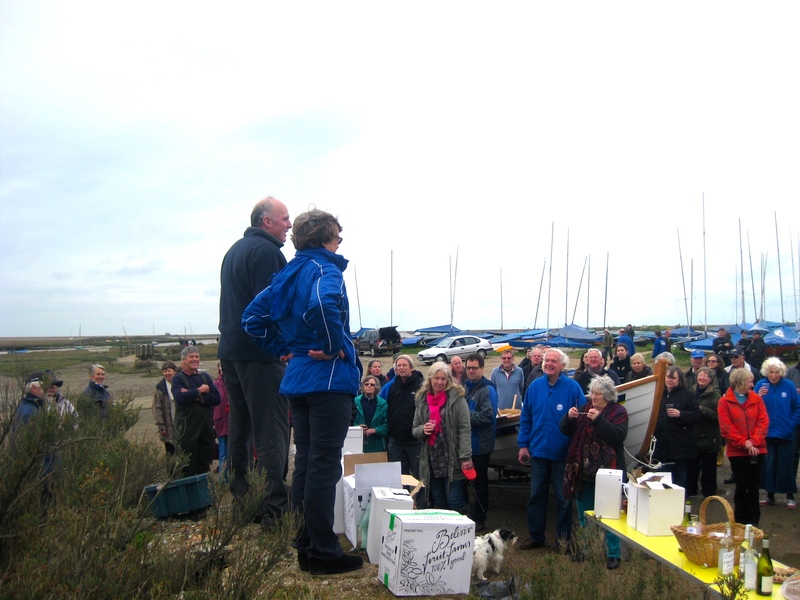 Many thanks to them, those I have omitted (my faulty memory) and all the other friends who have turned out at short notice when Bluejacket has needed turning over etc. – your help has been invaluable. 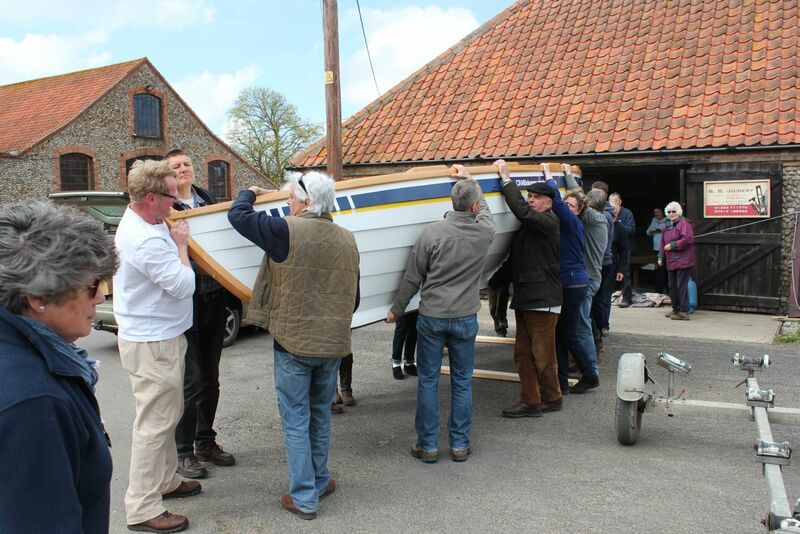 See you all at the launch on Saturday 26th April – 15:30 at Blakeney.